On this safari you will track the primates of Bwindi Impenetrable Forest National Park where you will track the remaining mountain gorilla in the world. 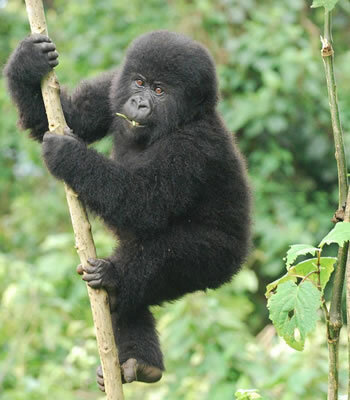 It is estimated that only 700 mountain gorillas are remaining worldwide. Therefore tracking some of these remaining World giants is a fantastic experience one should not miss out. Trekking through the deep thick forests of Bwindi in search of the mountain gorillas ranks among the top adventure world class activity that Uganda offer to its visitors. Day 1: Head to Bwindi Impenetrable Forest. This is a day for your gorilla adventure. Early in the morning after breakfast and briefing by a ranger guide, enter into the Gorilla Sanctuary for your adventure. The steeply forested landscape is incredibly dense. Gorilla forest Mammals in the forest include the endangered mountain gorilla, rare golden monkey, buffalo, and elephant, black fronted duiker, bushbuck, leopard, giant forest hog and many others. The park is known for its fascinating gorillas. The time taken and the terrain vary according to the movements of these marvelous primates. 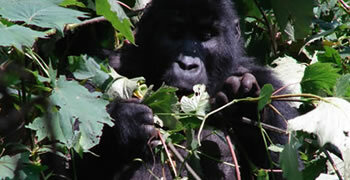 The thrill of spending time and observing the gorillas is a rare moving, awesome and exciting adventure. Overnight at Mahogany Springs/Lake Kitandara Tented Camp/Buhoma Community Bandas. You will leave Bwindi for Kampala after having your breakfast. You will have an enroute lunch and a stopover at the Equator to take some photos, arriving late evening in Kampala late evening.